I was there. Right in the middle of what up until now remains the defining moment of 21st century America. We had just taken off from Logan airport, 15 minutes ahead of the terrorists, some of whom had spent the night at the Days Inn-- right next door to WBZ-TV. They were probably there the night before when we left the building after wrapping the 11 o'clock news. Our anchorwoman Lisa Hughes and I were flying out together on an uncharacteristically "fun" assignment on that crystal clear Tuesday morning: we were headed to the big apple for an "official" fashion consultation. We landed at Laguardia at just about 8:30 AM, and took a limo into the city because the taxi line was so long. 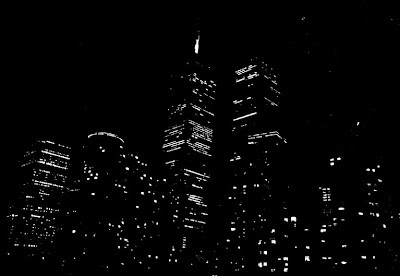 As we sat in the backseat, me nursing a cup of coffee and feeling a bit sluggish--I am not, nor will I ever be, a morning person--Lisa, characteristically alert and with it, looked up and said, "Looks like there's a fire in the World Trade Center." I immediately looked out the windshield to see dark smoke billowing from one of the Towers. The two of us thought, "This looks like it might be a big story..." Lisa immediately dialed the assignment desk back in Boston and the reports were that a small plane had crashed into the building. This really was going to be a big story. We were on hold waiting for instructions to see whether Lisa would be diverted to cover; it wouldn't involve me, since as the arts and entertainment reporter, the only emergencies in progress I ever covered were those that happened onstage when an actor bombed at the theater. Suddenly, the assignment editor got back on the phone and started yelling--"another plane"-- while we were sitting there-- "hit the other tower!" We looked up-- both towers were engulfed. Lisa and I looked at each other and knew what everyone knew in that instant: this was no accident. This was terrorism. What we didn't know was that the course of Lisa's life was forever changed in those moments, as was the life of the man she had yet to meet, but would eventually marry. A man whose wife was on one of those planes . We immediately instructed the driver to head for CBS; we were among the last few hundred cars to make it over the bridge before they shut the city down. The streets were almost instantly gridlocked. Phones were starting to jam. We got as far as Park Ave when we abandoned our vehicle-- it wasn't moving, and ran to the nearest hotel to get to a landline. While I was on the phone trying to make arrangements to stay-- we knew we were there for the duration-- our Boston assignment editor screamed, "They've hit the pentagon.... the pentagon has been hit!..." I remember feeling almost dizzy. I looked out to see chaos in the streets, everyone in a state of shock and wondering what kind of an attack, from whom, and how big? There were now reports of other hi-jackings. Was it all going to end like this? Lisa and I ran out into the street and kept running until we arrived at the network, out of breath and not knowing the scope of what was engulfing us. We got to the CBS newsroom and dazed producers there said,"Thank god you're here-- we need all the help we can get." And then, there was little we could do. No communications, no transmissions, no one allowed near the site, network anchors narrating what they could figure out helter skelter; all we could do was tear wire copy, keep notes, watch feeds, and stand by for... for... what? At 9:58 AM we watched the newsroom monitors as the first tower collapsed. There was a collective gasp; none of this could be real. When the second tower went down, I was almost numb. By this time I hadn't yet been able to reach my family-- no one knew where I was, or how I was. We made contact later in the day, and that night Lisa and I stood outside atop CBS, and filed our first live reports from NY to Boston. I will never forget New York City that night. It was dead quiet. Not a sound. No traffic, no wind, no birds. Nothing. The city was lit up behind us, but no one was visible on the streets below or anywhere. It looked like a painted set. And all the people were gone. The next day Lisa and I along with a phalanx of stunned reporters made our way down West Street to report from the scene. We were given masks to wear and I would be on duty after all; I was a reporter, and there, and ready to tell what I saw. We were within a mile of ground zero. There was debris, and white dust everywhere, and lines of rescue workers, and medical trucks, and police, and food trucks streaming in; and doctors who had volunteered from all over the country, and made their way to the disaster; people applauded them in as they made their way down the highway. We heard that Robert Deniro was delivering food from his restaurant to relieve the fire fighters and rescue workers. And there were hundreds of people roaming the streets crying, holding pictures of loved ones, asking if we had seen them. We interviewed many of these people on camera, in the hopes that someone might recognize someone, and the lost would be found. One of the saddest things was the sickening realization that despite the thousands of people standing by ready to help, there would be very few people to rescue. For the most part, you either made it out, or you didn't. Ten years to the day, it all came flooding back to me. I have been low all day. It is still there, several layers down. Though I have told the story many times, I have never written it down. I think of Lisa Hughes and her husband Mike Casey and their newly adopted baby boy and I am encouraged. I will call her, and thank God that we are still here. A chilling account, Joyce. To think how close you came to the terrorists, to have been on a plane flying out of Logan that very morning . . . My heart was racing as I was reading this. Wow i feel like i know you Joyce from over the years ...its like you were a close friend who saw history and lived to tell about it..